AvGeeks in the Twin Cities are fortunate to have a great aircraft viewing area right in the middle of the airport, and it's a popular spot for aviation enthusiasts of all stripes - from families out watching airplanes for the first time to the folks perched on step ladders with comically large telephoto lenses. Being one of the aforementioned folks up on a ladder, I've been approached by people wondering how we know about all of the cool aircraft that are coming. To quote Apple's now decade(!) old trademark, "there's an app for that." The commercial flight trackers listed here aggregate data from a variety of commercial and government sources, as such, they're subject to some censorship - most military, lots of private traffic, and even some commercial traffic will not appear on them. FlightRadar24 is probably the first option budding aviation spotters ought to consider. Their UX (user experience in tech-geek-speak) is unrivaled when it comes to mapping airborne flights, and their apps have a really cool augmented reality feature that allows you to point your device's camera at the sky and all of the aircraft in your field of view will be labeled in real-time. In both cases, clicking or touching an aircraft on the screen will pop open a window with photos, arrival/departure information - you name it. There's a reason whenever a cool flight is going somewhere it's a screenshot of FR24 that gets shared - nobody else makes an app that's as fun to use. All of the features mentioned above (and a ton that aren't - they've got fleet info, airport info, etc.) are freely available. For some more bells and whistles, they offer a few tiers of subscriptions on a monthly and annual basis. Their gold tier, at $3.99/month is the sweet spot for me. If you're looking for alerts, they offer them, and they'll come as emails or push alerts depending on if you've configured them on their website or via their app. They allow alerts by aircraft type, registration, airline, and flight number, and allow you to add some rules and options to filter things out (every B74 arriving at MSP that isn't Delta, for example). The downside is alerts are for inbound flights, and their data, while very, very good, is not as extensive, and slightly more glitchy than FlightAware's alert product, at least here in the States. FlightAware is a distant second place to FlightRadar24 when it comes to user experience, but what FlightAware lacks in usability, it makes up for with data credibility. Generally speaking, for flights in the US and Canada, FlightAware is probably the most reliable source for estimated arrival times, solid id's for which aircraft are going where, and so on. FlightAware had offered a consumer/enthusiast level subscription in the recent past, however, it's no longer available. They have a free tier which allows you to setup up to five alerts, otherwise their lowest cost offering is $39.95 - clearly not a price point aimed at enthusiasts. If you're really interested in getting access to their higher quality data and the alerts that are tied thereto, you might consider setting up an ADS-B ground station for them (or any of the other flight tracking providers) - that requires setting up a small antenna and computer (a Raspberry Pi) - I think it's probably a bit more work than the average non-computer enthusiast might want to bite off, but, your mileage may vary. I've got one of their receivers setup in my attic, and it very cool. 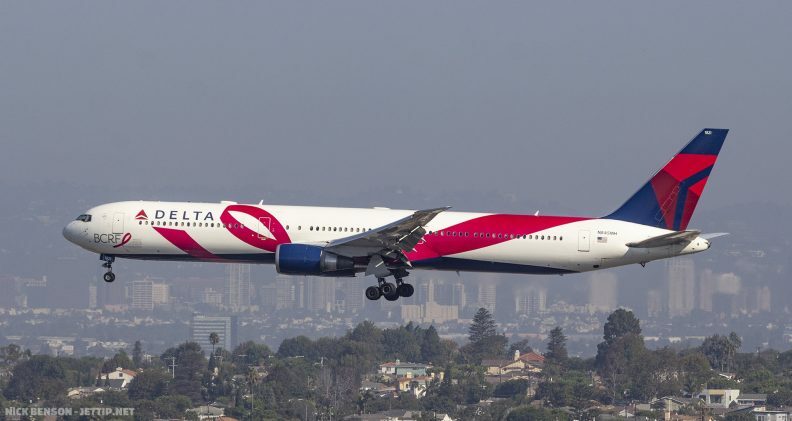 JetTip will automatically send an alert when getting an infrequent visit from a special livery, like this Delta 767 in the Breast Cancer Research Foundation scheme. Now that I've spent a few paragraphs talking about how to get flight alerts from other companies, let me tell you about the ones I'd like to sell you! JetTip approaches flight tracking from an enthusiast's perspective. JetTip has arrival departure boards, but they're filterable, and make it easier to find the flights an avgeek would be most interested in seeing. If you just want a list of all of the heavies, international carriers, or want to exclude flights from hub airlines from the list, JetTip does it. Smart flight alerts are JetTip's flagship feature, and they're based on a curated list of noteworthy aircraft and historical analysis of every flight at an airport. If there's an interesting plane that hasn't visited your airport more than twice in the last 30 days, you'll get a text or an email. That means you don't have to setup an alert for every new special livery that comes out (or delete the alerts after they get repainted), and you'll get alerts when unusual airlines visit. JetTip also labels aircraft based on their livery (paint), not just their operator; for example, an Atlas Air 767 wearing DHL paint will be listed on the arrival/departure board as a DHL aircraft, not Atlas. JetTip is $5 a month, and has coverage at more than 200 airports across the US and Canada. There are plans for further international expansion, but as a one-person company, regulatory and financial constraints keep things from moving too quickly. What if you want to see a map that includes all of the private, commercial, and lots of military traffic? Well, there are apps for that too. Just as there are large groups of people with their own ADS-B stations feeding data to FlightAware and FlightRadar24, there are also non-commercial flight data aggregators collecting all of that data, and they don't bother censoring it. Some of them argue that all of the position data is being broadcast over the air in an easy to read format, so any effort to obfuscate or censor it is merely "security theater," and on the other side of the coin, many in the private aviation space feel its a violation of their privacy to be tracked digitally. Either way, the cat's out of the bag now, and if you're interested in aviation, it's worth knowing about all of the tools at your disposal. In North America, the most widely used aggregator of real-time flight data seems to be ADS-B Exchange (click on "Global Radar View > Global Radar" to see the map). They've got pretty good coverage, and it's a great way to find out if your airport might be getting a visit from interesting private or military aircraft. Bombers and fighters don't show up, but you'll see pretty much everything else - that can include Air Force 1, C-5 Galaxies, C-17 Globemasters, tankers, trainers, you name it. If you're avgeeking at an airport that sees occasional visits from non-combat military aircraft, it's a great way to keep an eye out for them - they even have a filter option to show military aircraft. Their mobile website isn't terrible, though I prefer to view their data via the OpenADSB app on my iOS device. OpenSky Network is another open flight data aggregator, though it approaches things from an academic perspective. Their coverage is not as complete in North America as ADS-B Exchange, but, they're worth mentioning. So, commercial flight trackers offer alerts, and there are plenty of options for the real-time mapping of flights... what else is there? LiveATC.net allows you to listen in on the radio communications at your airport, which can be essential if you're trying to position yourself for photos and need to know which runway a flight will use for arrival or departure. Certainly a steeper learning curve than looking a map or a list of arrivals/departures as you can on the other apps, but it serves a very different role. If you're just getting started, take a look at FlightRadar24. As your transformation to a full-blown AvGeek proceeds, check out JetTip, LiveATC, and ADS-B Exchange. If you're looking for a geeky project, take a look at building an ADS-B receiver and sharing your data with an aggregator.